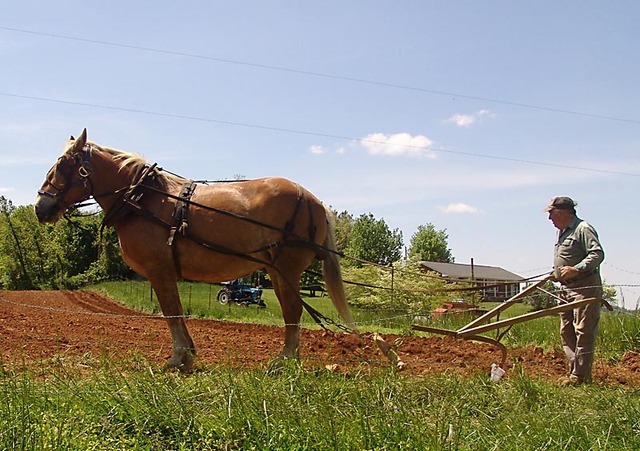 This is not a sight you see every day, but here in Floyd County, Virginia, if your timing is right, you can watch JC Thompson and his horse Sandy plow his garden plot. It is is one of the most satisfying sights you can imagine. I have waited for almost a year to capture these photos. Sandy pulls the single bladed plow through the somewhat rocky soil under JC’s direction and the furrows line up as pretty as you please. Occasionally she stops to check something out, but JC coaxes her into action with a skill honed by years of experience and the work goes on. 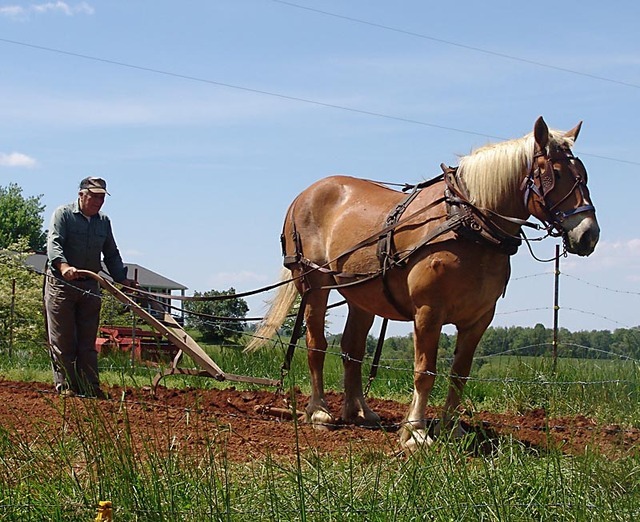 Managing a horse drawn plow takes strength and good control of the horse. JC works with the reins tied around his waist so that he has both hands free to guide the plow. At the end of row he makes the horse turn in place and is able to back the horse up so that the plow starts each furrow exactly where he wants it to. I have a short video of them plowing which I will post in the next few days. JC has been plowing this way for many years and has been using Sandy for the last three years. From the way they work together, I’d say she has got the hang of it. This entry was posted in Country Living and tagged Floyd Virginia, horse drawn plow, JC Thompson. Bookmark the permalink. Ya finally got it! Congratulations. With fuel the way it is we may be seeing more of draft power. Don’t try this at home though, normally you’d only want one shoulder through the reigns if something goes amiss a duck of the head releases you from the loop. BTW that’s a layoff plow, looks like JC is planting some spuds.